Michigan - the Great Lakes State - is a fisherman's paradise. Surrounded to the west, the north and the east by the waters of the Great Lakes - not to mention the countless reservoirs, natural lakes, potholes, rivers, streams and flowages that dot the Michigan map - and there's little wonder why the state has the nickname that it does. Heck, even the name "Michigan" suggests how good the fishing is here, being a French form of the Ojibwa Native American word "mihigamaa" which means large water or large lake. Find one of those water bodies or lakes inside the borders of Michigan and you've undoubtedly found a first-class, if not a world-class, fishery. From the trout that swim rivers like the Au Sable (and provide the inspiration for Ernest Hemingway's "Big Two-Hearted River") to the salmon and walleye of the Great Lakes to the muskies, perch, bluegills and black bass of Pure Michigan's 11,000-plus lakes and rivers, the simple truth is that an angler will never run out of a place to wet a line in the state. Especially in the Alpena area, a quaint fishing town of nearly 12,000 people living on the shores of Lake Huron's picturesque Thunder Bay. That might help explain why the cameras, tournament officials, Outdoor Channel workers and the 24 professional anglers of Jack Link's Major League Fishing, and even Jack Link's Sasquatch himself, recently found themselves in this beautiful northern Michigan community for the filming of the 2014 General Tire Summit Cup. "We are known for some of the best bass fishing in the state," said Mary Beth Stutzman, president of the Alpena Convention and Visitor's Bureau. Stutzman isn't kidding either. Some of the best smallmouth bass action anywhere in North America can be found in the area on waters like Lake Huron, Beaver Lake, Four Mile Impoundment, Lake Winyah, Grand Lake, Long Lake and Hubbard Lake among others. From catching lunker-size smallmouths - five pounds or better at times - in some of those spots to landing dozens of small to medium-size smallies in other waters, there are few better places in the U.S. to chase the acrobatic bronzeback bass. But smallmouth aren't the only black bass species found in the Alpena area, mind you. Northern strain largemouth bass are numerous and at times sizable on the lily pad and emergent vegetation filled waters of Thunder Bay River and in the waters of the well-known Fletcher's Pond. The latter, named for George Fletcher, one of Alpena's founding fathers, is anything but a pond. In fact, this large hydroelectric impoundment is closer to being the Michigan version of Texas' famed lunker largemouth bass fishery at Lake Fork. That's because the shallow lake is nothing more than 9,000-acres of a flooded cedar tree forest where some of the state's best largemouth bass habitat is found in the timber choked water that features numerous stumps, logs, lay downs, points, drop-offs and islands. Keep in mind that the region's ample recreational fishing opportunities, including outstanding ice fishing during the winter months, is only one part of what makes this semi-remote area of northeastern Michigan so much fun to visit. Plenty of people come to the area to see the beautiful shoreline of Lake Huron's Thunder Bay, a Great Lakes coastline that stretches for miles and miles to the north and south of Alpena. 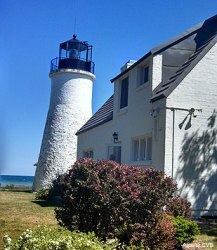 The Old Presque Isle Lighthouse, built in 1840, is one of the oldest surviving lighthouses on the Great Lakes. 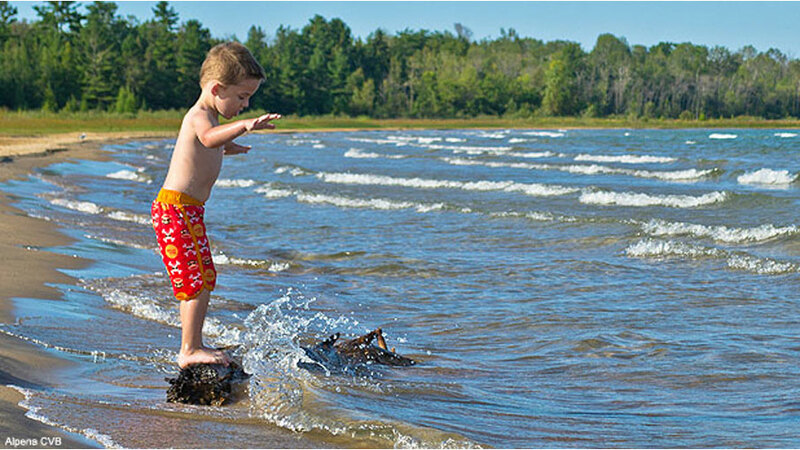 With a number of beautiful beaches and rocky shorelines to explore, the Bay's waterfront in and around Alpena is a great place to swim, beach comb, hike, watch bird life and wildlife, and take photographs. Some of the more striking photographs that can be taken with a digital camera are around the numerous lighthouses that surround Alpena. These safety beacons have served over time to warn maritime interests, commercial ocean-going vessels, and fishing boats of a variety of dangers along the rugged Huron shoreline. How rugged is the coastline? The waters adjacent to Thunder Bay are among the most treacherous in the Great Lakes system. From dense fog to blinding blizzards to hull-punching ice flows to sudden gales, the rocky shoals near Alpena have lived up to the area's nickname of "Shipwreck Alley" down through the years. So numerous are the shipwrecks (there have been upwards of 200 wrecks in and around the area ranging from an 1844 side-wheel steamer to a modern 500-foot-long German freighter in recent years) that in 2000 a 448-square mile area near Alpena was designated as the Thunder Bay National Marine Sanctuary and Underwater Preserve. Access to the National Marine Sanctuary shipwrecks is not restricted by the federal government or the state of Michigan. In fact, the deeper shipwrecks can be viewed by glass-bottom boat tours and various diving skill levels while the numerous shallower wrecks can be seen by people snorkeling, kayaking or riding in a recreational boat. For those wanting to examine the shipwrecks without getting wet, there is the Great Lakes Maritime Heritage Center in Alpena that hosts upwards of 60,000 visitors each year. The Marine Sanctuary's visitor center features a full-sized replica of a Great Lakes schooner that simulates what mariners deal with during a violent Lake Huron storm; some 9,000-square feet of exhibits; a 93-seat theater showing educational films every day; an archeological conservation lab; various scientific research facilities; a dive operations center; outdoors trails and picnic grounds; a community boat-building center and a gift shop. 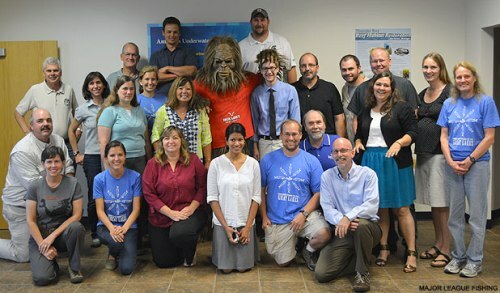 The Jack Link's Sasquatch crashed what appeared to be a very important meeting at the Marine Sanctuary's visitor center. Everyone decided it was time for a break and to take a photo. Keep in mind that lighthouses and shipwrecks are but one facet of the rugged Great Lakes beauty and lore that a visitor to the Alpena area can sample. By boat, several islands off the Thunder Bay coastline can be visited. Some of these islands make up a part of the Michigan Islands National Wildlife Refuge, a refuge that attracts numerous forms of wildlife and bird life. Nearby Scarecrow Island is another spot to visit, a part of the Michigan Islands Wilderness Area. How are these spots in and around Alpena accessed? After arriving in the community by air travel or ground transportation, visitors can access certain attractions by boat. Others are available to visit by traveling along the length of U.S. 23s "Heritage Route" that moves up Michigan's "Sunrise Coast" from Standish to the south, through Alpena, and on to Cheboygan and Mackinaw City to the north. That route along the Lake Huron shoreline will give visitors a chance to sample Huron's aquatic culture; the region's numerous and historic lighthouses; the surrounding national forests and wetlands; and the various small towns and communities complete with museums, shopping venues, fishing opportunities, golf courses and dining hotspots. While an adventure in northeastern Michigan may take a person to one of the area's many natural and cultural treasures, any journey to the region should begin and conclude in Alpena, one of the most picturesque All-American cities that one can visit. Sites to visit in Alpena include the community's City Hall; the County Courthouse building; the Daniel Carter Family abode (home to the area's first settlers); the First Congregational Church of Alpena; and the St. Bernard Catholic Church among others. Museums, mills and visitor attractions celebrating the area's lumbering and lumberjack tradition; the Great Lakes sailing and boating heritage; and the northeastern Michigan concrete and industrial workforce are also scattered around town. In and around the lakeside downtown district itself are such gatherings as the June "Alpena Blues Festival," 4th of July "Thunder Bay National Marine Sanctuary's Maritime Festival," mid-July "Brown Trout Festival" and the "Great Lakes Lighthouse Festival" in early fall. In fact, there is almost always some sort of unique outdoors celebration going on each weekend during the spring, summer and fall months in Alpena. Even when such civic gatherings are not taking place, the community has a bustling downtown district that provides numerous shopping opportunities. After shopping, the area has numerous eateries like Burgies gourmet burger shop; the Fletcher Street Brewing Company with its micro-brews, handcrafted sodas, and brats and hot dogs; to the Downtown Scoops ice cream parlor with its 24-flavors, custom sundaes, and shakes/malts. 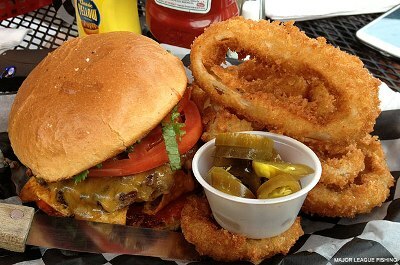 A gourmet burger from Burgies. With all of this in mind, what's the bottom line about the Alpena area? It's a region and community full of top-notch waters to fish; a rugged coastline and beautiful wilderness area to explore; and a bustling community worthy of a stop or extended stay to sample all of the food, culture, shopping, recreation and history that make this community one of the most interesting spots in all of the Midwest. It's little wonder that the MLF pros decided to visit recently to stage the General Tire Summit Cup competition. Because in the final analysis, Alpena, Michigan, is definitely a Major League Fishing kind of a town.